The bustling Viktualienmarkt, Munich's best daily outdoor market, is located in the heart of the city’s Altstadt (old town). Over 200-years-old, it is a must-see Munich site and an attraction for locals and tourists. This market predates its current location. The market began in the city's main square, Marienplatz, but quickly outgrew the space. King Maximilian I decreed that it be moved to this nearby square in 1807, making it the oldest farmers market in Munich. Its name is derived from the Latin word victualia, which means "groceries". During World War II, the market was severely damaged and the city wasn't sure if it would rebuild. A push from the public with a considerable amount of donations saved the site and added elements like a memorial fountain. On November 6, 1975 the area was designated a pedestrian zone, making it an ideal meeting point and people watching spot. It has been expanded several times and spans an impressive 22,000 m2 (240,000 sq ft). There is now a butchers' hall, bakery, fruit vendors and a fish hall. 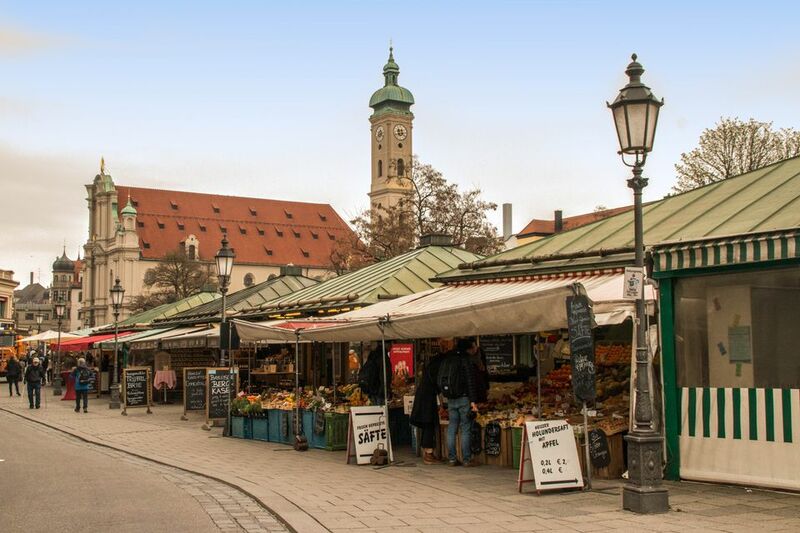 The Viktualienmarkt is Munich’s premier place to shop for fresh produce, dairy, bread and Bavarian specialties. Locals, tourists, and the city’s top chefs come here to fill their baskets with everything from fruits, vegetables, meat and seafood, to pastries, honey, spices, flowers and fresh squeezed juices. Browsing Viktualienmarkt is a feast for all senses. Six days a week you can sample from more than 140 booths and farm stands. Each is beautifully decorated with garlands of sausages, mountains of vegetables, cascading flowers, and pyramids of fruits. Karnoll's Backstandl - You can't go to Munich without having a Brezen (pretzel) and Karnoll's serves the best. Kafferösterei on Viktualienmarkt - Opened in the 1990s, this permanent shop was ahead of the curve. an everyday stop for many locals. The owner, Christian Müller, roasts the beans nearby and their dedication to eco-electricity, organic milk, and recyclable cups ensure their continuation in the future. Wurststandl Teltschik - The go-to lunch place in the market, Bratwürste, Weißwürste (only til noon as tradition states), and many other essential sausage experiences can be had here. Münchner Suppenküche - For over 30 years the "Soup Kitchen" has been overing classics like Leberknödel and Pfannkuchen. Grab a bowl for just 2.80 euro. Honighäusl am Viktualienmarkt - Visit the honey house for the sweetest treats in the city. Everything from shampoo to mead to candles has been touched by the golden stuff. In the heart of the Viktualienmarkt, you will find a beer garden. Shaded by hundred-year old chestnut trees, this is a wonderful place to take a break from shopping and to watch the bustling market scene around you. The beer garden, which sits over 600 people, features some of the best Munich breweries. About every six weeks a different beer is offered from one of the legendary breweries like Augustiner, Hacker-Pschorr, Löwenbräu, Hofbräu, Paulaner and Spaten. Order a standard .5, or go for the big guy, a full liter called a Mass. The beer garden is also open during winter, now selling Glühwein in addition to beer. Also try the hearty Bavarian specialties, like Schweinshaxe (roasted pork knuckle) with sauerkraut and dumplings, warm potato salad, or a simple Brotzeit platter with cold cuts and homemade artisan cheese. You can also bring your own food. The beer garden at the Viktualienmarkt is part of our list of The Best Beer Gardens in Munich. Discover what to expect at a German Biergarten. For Christmas, the Viktualienmarkt becomes Alpenwahn. Handmade goods, carols and delicious sweets fill the market with good cheer each day. The market is an important setting for many other events throughout the year. Bavaria's schedule is full of folk festivals like Brewers' Day, as well as being the opening site for Spargel (white asparagus) season, summer festival as well as the dance of the market women on Weiberfastnacht. Viktualienmarkt: Mo - Sat, 8:00 a.m. - 6:00 p.m.
Beer Garden: Summer, Mo - Sat, 9:00 a.m. – 10:00 p.m.; Winter, Mo - Sat, 9:00 a.m. & 6:00 p.m.
Getting to Viktualienmarkt: All S-Bahn lines or U3 and U6 to "Marienplatz"